Preparation of kefir. This takes a few minutes. Experience has indicated that the culture is present throughout the fermented kefir, meaning there is no point in straining the grains out. Homogenized milk (400ml) is mixed with a tablespoon of solids and placed in a 20C area for 24 hours until the solids and whey separate. I simply stir the mixture and drink a glass daily. Pictures depict the procedure. 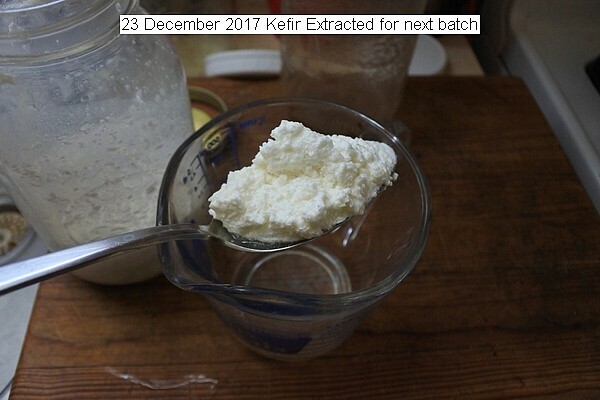 This entry was posted in Uncategorized and tagged 23 December 2017 Kefir, Kefir about 400 ml, Kefir daily consumption. Bookmark the permalink.